The new British Army advert is astonishing. ...Organised violence as antidote to anomie. This image – one of a series – shows soldiers larking about in the ruins of some land. The emphasis is on ‘Belonging’ ‘camaraderie’ and community, all attributes noticeably missing from contemporary life, and arguably even more so from young men’s lives. But here’s the twist. Belonging comes from occupation. The squadddies are having a real laugh in the bombed wreckage of somebodies home, somewhere. The British Army employ ad companies to create this mood-music In this instance a company called Karmarama. The campaign they say draw inspiration from Millennials’ oft-stated desire to find a career that allows them to make a positive difference to the world. 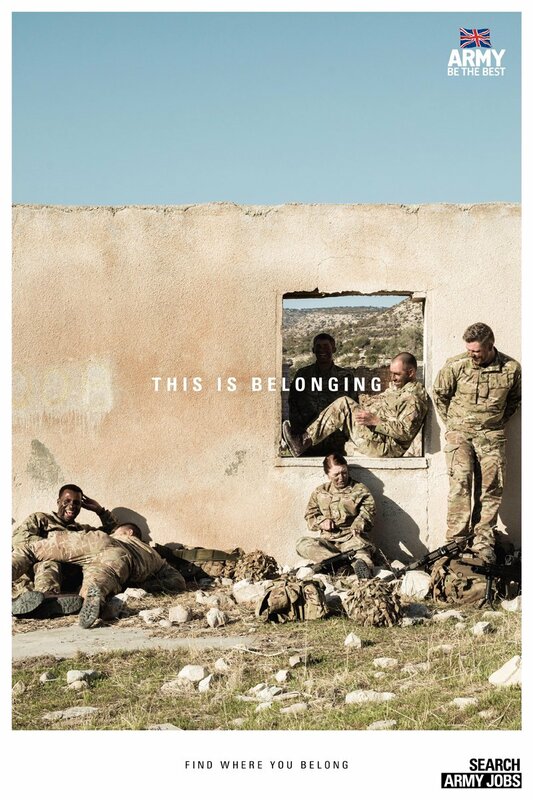 “We decided to highlight real and authentic army contexts and moments that clearly show the importance of being part of a strong and selfless family that accepts you for you, and gives you the chance to work together for a meaningful purpose,” says Nik Studzinski, Chief Creative Officer at Karmarama. Organised violence as antidote to anomie. Invasion as response to crisis of community. Be the Best.